In 1914, Chubby and his wife Bessie opened a small concession stand on Main Street in Essex. On weekends they sold small grocery items, homemade potato chips, and fresh clams that Chubby dug himself. At first business was slow, but on July 3, 1916 things began to change. However, when the three patrons left, Chubby and Bessie started to think. What if we did fry up some of the clams and sold them? If by chance they tasted good, then Chubby would have created a way to increase the demand for his own shucked clams. “Let’s try it,” Bessie said as she tossed a slab of lard into the fry pot normally used to make potato chips. So they shucked some clams out of the shell, experimented with different batters and called over some locals to give them a taste. When the overall verdict was “delicious” they knew they were on to something big. The next day, during the 4th of July parade, Chubby and Bessie presented the first friend clam to the citizens of Essex and the Yankee appetite has never been the same since. A year after the Woodmans’ experiment, a Boston fish market advertised that it was “now equipped to serve the new taste treat – fried clams.” And Howard Johnson, owner of a chain of restaurants that at one time had 100 spots across the East Coast, came himself to learn how to fry clams from Chubby. 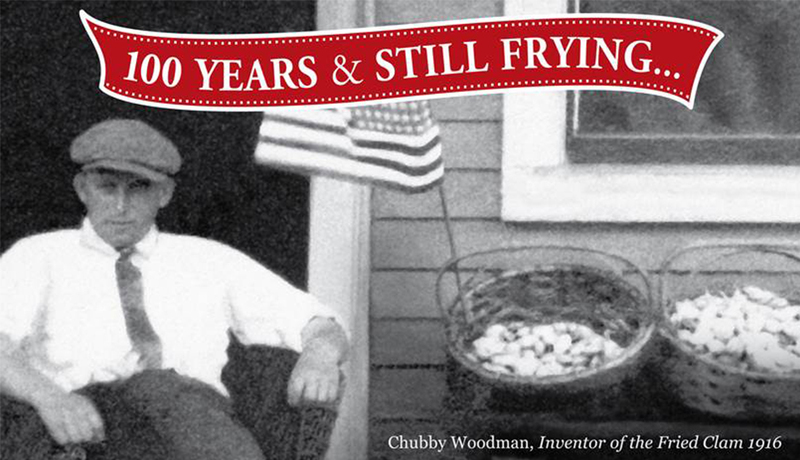 One hundred years and five generations later, the clams are still frying at Woodman’s, where it all began. To learn more about Woodman’s, please visit www.woodmans.com.